The Exception and The Rule: On Being Stage IV. You are weak; you are weary, and your spirit is broken. Your opponent is stronger than you, more resilient, and more clever. You face overwhelming odds of defeat. In a wager for your life, would you bet on you? And as you turn to face your opponent, are you the exception or are you the rule? Stage IV cancer does not come with a safety net. There are no do-over’s or second chances, and for those of us diagnosed with stage IV cancer, we enter the most crucial phase of our lives, where nearly every second and decision made becomes one of life and death. 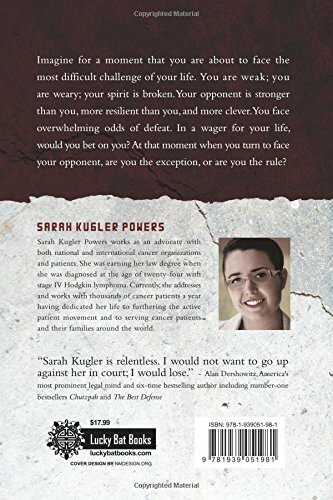 In this inspirational, heart-wrenching, and unbridled work, Sarah Kugler Powers in The Exception and The Rule: On Being Stage IV, shares the experiences and the lessons she learned during the years she underwent cancer treatment. Sarah discusses in-depth topics such as: having difficult conversations with family and friends, working with doctors, dealing with depression and anxiety, and facing death. In taking the reader with her through her own grief, anger, and constant struggles, Sarah’s story affords the reader a first-hand look at the conversations, the heartbreak, and the circumstances surrounding some of the greatest questions patients must face and ask of themselves and their medical teams. 10% of all lifetime profits are donated directly to the non-profit cancer organization The Half Fund. Read more about The Exception and The Rule and about Sarah Kugler Powers on her website: SarahKuglerPowers.com. Sarah Kugler Powers’ story spans a three-year period and includes content derived from Sarah’s meticulous and detailed records. She takes the reader through her personal experience with cancer and affords the reader the opportunity to experience first-hand what it truly is to be stage IV. Sarah Kugler Powers is an accomplished academic scholar, holding multiple degrees in sociology, political science, and economics. In 2008, Sarah was awarded one of two academic research positions to begin working with the international economic consulting firm, Public and Corporate Economic Consultants at the University of Cambridge, UK. In 2009, she returned to the United States where she took a position with the international business management consultancy firm, Turner & Townsend. In 2011, she began her legal studies at the University of Connecticut School of Law and was diagnosed with stage IV cancer shortly after. In December 2011, at the age of twenty-four, Sarah Kugler Powers was diagnosed with high-risk advanced unfavorable stageIVBX Hodgkin lymphoma, which was refractory to front-line ABVD chemotherapy. The aggressiveness of Sarah’s cancer required implementing the highly toxic German chemotherapy regimen escalated BEACOPP, as well as a third high dose chemotherapy regimen. On September 3rd, 2012, Sarah received a bone marrow transplant at Stanford Medical Center, followed by a high-dose targeted radiation treatment plan. Following her cancer treatment in 2013, Sarah continued her legal education at the Southern Methodist University Dedman School of Law in Dallas, Texas. Shortly after beginning at the Dedman School of Law, Sarah joined the prominent Texas law firm Prospere & Russell, a private criminal defense firm.